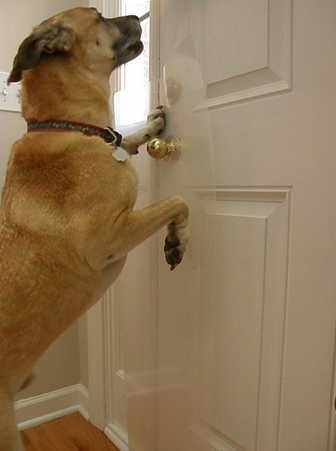 Everyone owes Rocco and Foster Innovations (R&F) a huge round of applause because they finally found a way to get your furry loved ones to stop scratching at the door! A badly scratched door can cost money, take up your time, and make your house look unkept, but it’s a part of life when you have pets. Well, R&F found a way to protect the door and still have your house look nice. It’s called CLAWGUARD and it’s going to change the relationship between your pets, you, and your home! 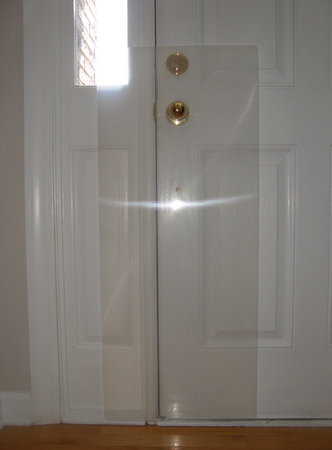 Never again do you have to spend money replacing doors, because now you can simply use this polymer plastic shield to fit over the door hardware and not only protect the door but the surrounding frame as well. It fits all exterior and interior doors and it has a Velcro fastener to secure it to the bottom of the door. It’s super easy to install and it’s transparent so it doesn’t look tacky at all! You can customize or trim it with scissors. It’s very durable and it’s also easy to clean if something gets on it. There’s a smooth OR textured surface for optimum noise control, you pick! No hardware required! I received a CLAWGUARD and it’s such a great resolution to all my pet problems. Never again do I have to worry about my pups getting splinters! Plus, this thing is lightweight so although you may think it will weigh down your doors, it doesn’t! No more paint shedding or tacky scratch marks in this home!!! It was so easy to install I couldn’t believe it! The dogs don’t even notice it so it hasn’t caused any disruption, except of course to the door.. since it’s now protected! What a great product I highly recommend you invest in one of these because it’s affordable and it will save you time and money in the long run!